When Lucasfilm finally announced that the title of Star Wars: Episode IX is The Rise of Skywalker, fans wasted no time switching from smiling wide at the reveal to speculating intensely about what it could mean. Questions of who is rising, which Skywalker the title refers to, and whether one of the trilogy's main characters would be confirmed as a member of the Skywalker family swirled through the Star Wars fandom. While fans won't get the answers to their inquiries or have their theories validated (or shot down) until The Rise of Skywalker opens in theaters on December 20, Star Wars legend Mark Hamill has thrown his two cents into the situation, stoking the flames of the speculation fire. Hamill, whose famous Star Wars character Luke Skywalker seemingly died at the end of The Last Jedi, took to Twitter to respond to all the conjecture surrounding The Rise of Skywalker. The actor absolutely loves that fans are going wild with their Rise of Skywalker theses — and even offered up his own ideas about who the titular Skywalker might be. Hamill also gave the enigmatic title his stamp of approval. 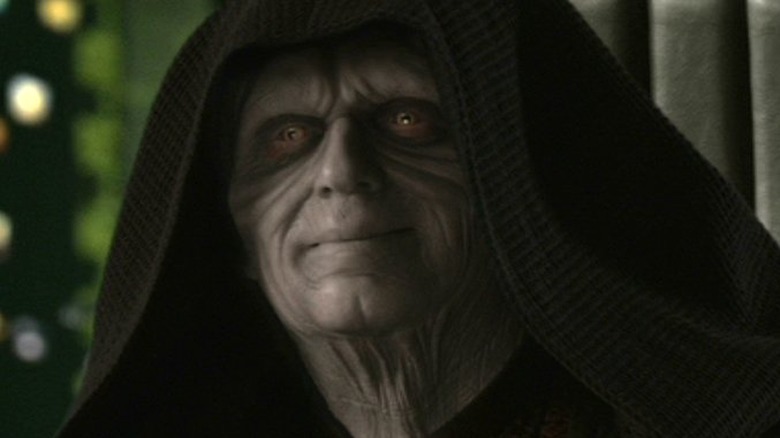 "It's not #EpisodeIXFromHisNap or even my suggestion: #EpisodeIXABunchMoreStuffHappens- It'#EpisodeIXTheRiseOfSkywalker! It's time for the 8 months of speculation to begin. Is that Skywalker KYLO? LEIA? ANAKIN? LUKE? A previously unknown SKYWALKER? Is REY a Skywalker? #CoolTitle," Hamill tweeted, adding a thumbs-up emoji to the tail end of the post. As soon as Hamill pressed "send" on that tweet, he effectively opened another floodgate for fan theories to pour through. Thousands of people responded to Hamill's post, sharing predictions about what will happen in The Rise of Skywalker and how the film's events tie into the title (and vice versa). Chef Mike Haracz theorized that the final battle of The Rise of Skywalker will be between Rey (Daisy Ridley) and Kylo Ren (Adam Driver), with "a bunch of force ghosts on both sides fighting along side them/giving them power." In Haracz's vision of the film's climax, Darth Vader — a.k.a. Anakin Skywalker — appears and aids Rey. Thus, he is the Skywalker who rises, according to Haracz's theory. One fan responded to Haracz's idea with a minor revision: in a moment reminiscent of Return of the Jedi, the ghost of Emperor Palpatine, who is seemingly heard cackling at the end of the Rise of Skywalker trailer, pops up behind Kylo, while the ghost of Luke Skywalker appears behind Rey during the duo's battle. "Kylo is winning, and then corrupt Anakin/Vader appears, removes both influences from the fight and… Brings Balance to the Force," user @NeroXLIV tweeted. Another fan suggested that The Rise of Skywalker isn't about Anakin Skywalker but about Kylo Ren (otherwise known as Ben Solo), who has Skywalker blood thanks to his mother, Leia (the late Carrie Fisher). "It's about Ben's redemption!!!! Ben is the last Skywalker!" they wrote in response to Hamill's tweet. "He will rise from the dark and ask Rey out!" Kylo Ren could drop his dark side moniker, return to the light, and reassume his given name of Ben Solo in The Rise of Skywalker. That isn't too wild an idea considering he's the only other known Skywalker apart from the apparently fallen Luke and his mother Leia, and that he wasn't always the First Order-leading baddie who wanted to follow in his grandfather Darth Vader's footsteps. Breaking free from the influence of the dark side just to ask Rey on a date? That's a stretch, but hey, we don't actually know what director J.J. Abrams dreamt up for The Rise of Skywalker. Maybe he'll shock us all and include some rom-com action in the film? Oh, who are we kidding — it sounds silly even saying it. With war raging in the galaxy, there's little time for romance! One other popular theory about who the nominal Skywalker of Rise of the Skywalker is claims that it isn't a single person at all. Some fans believe that "Skywalker" will be a new name for the Jedi, and that Rey will lead this group of Force-sensitive people to bring peace to the galaxy. Twitter user Dan Sandler suggested that the Skywalker name might be included in the ancient Jedi books — the sacred texts that Rey took from the mystical Force tree just before Yoda burnt it down in The Last Jedi. Though Yoda says that the "library contained nothing that the girl Rey does not already possess," the books contain all that Rey would need to teach a new generation of Jedi. But as Sandler speculates, there may not be Jedi anymore. In place of the Jedi Order, Sandler suggests, there will be Skywalkers — a combination of Jedi and Sith. "My theory is that 'Skywalker' will turn out to be referenced in the old Jedi books. That it is not a person but the name of the merger between dark side and the light (Jedi/Sith). A balanced union going forward, [not] two opposing entities," he tweeted. "So Jedi/Sith fall & Skywalkers rise." This idea connects pretty seamlessly to the title of the most recent Star Wars film: The Last Jedi. Many assumed that the title referred to Luke Skywalker, and maybe, just maybe, they're right. Perhaps Luke really is the last person in the galaxy who will be known as a Jedi, and future Force-sensitive individuals will be called Skywalkers instead. For every Star Wars fan out there, there's a different theory about The Rise of Skywalker. It would be too great an undertaking to try to pick apart every idea and gauge its believability — but what we can hold on to leading up to the film's release is something director Abrams himself has revealed about the film: "This movie is about the new generation. What they've inherited, the light and the dark, and ask the question about facing the greatest evil: are they ready?" Fans will have to ask themselves if they are ready for what's to come when Star Wars: The Rise of Skywalker opens in theaters on December 20.